It’s hard to believe that the Mario Kart franchise has been around for nearly 20 years and appeared on eight different consoles. Mario Kart: Super Circuit may have been first released in 2001, but now it’s back for a whole new generation of players ten years after release through the 3DS Ambassador program. There are four cups to play, with four tracks in each, as well as a fifth unlockable special cup. Many of the tracks reflect classic settings in the Mario series, and some settings are completely original to this game. Taking a page right out of Super Mario Kart's book, all of the tracks here are completely flat apart from a few small bumps. Just like in any Mario Kart game, there are items that can be picked up and used to aid you while racing. Many classic items are featured, including mushrooms that give you a speed boost and red shells that home in on your opponents. You can also collect coins to increase your kart's top speed, with currency also needed to unlock some classic tracks too. The cast of characters is a little on the thrifty side, featuring the same eight characters from Mario Kart 64. Though there may not be that many different drivers to choose from, they each vary in weight and speed, making the selection enough for any player to choose their favourite type while still getting a bit of variety. The controls are both simple and intuitive. The A button is used to accelerate while the B button brakes, and the D-Pad is used to steer your kart. The right shoulder button can be used to drift, making getting around tight corners an easier task, while the left shoulder button uses items. This 3DS port also allows you to use the Circle Pad to control your kart. While the Circle Pad’s positioning on the 3DS console may be more accessible and easier to reach, it does seem to be a bit more sensitive than the D-Pad, so may take a bit of getting used to. Some of the biggest draws of the Game Boy Advance original were the extraordinary multiplayer modes. 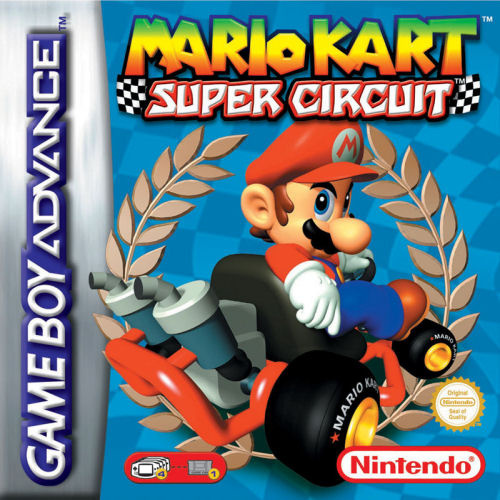 Ranging from Grand Prix to Battle Mode Mario Kart: Super Circuit provided so many GBA owners with hours upon hours of multiplayer entertainment. Unfortunately the multiplayer modes on this 3DS Virtual Console release are rendered completely useless. If you were planning on using the multiplayer features, then you’re going to be severely disappointed when you realise that you’re stuck with the basic single player modes. As far as the audio and visual presentation go, it’s safe to say that this game has not stood the test of time too well. 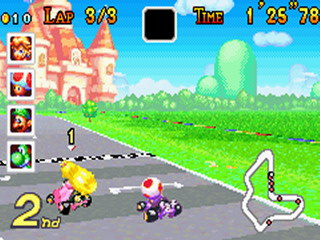 While the soundtrack may be fun and is very fitting for a Mario Kart game, the graphics look dated and flat: character sprites look as good as can be expected from an early GBA game, but many of the courses just look grainy and unclear, especially when they feature fences, grates or other complex textures. Playing in the original resolution — press Start or Select when loading — does help, but it's still not aged particularly well. Of course Super Circuit doesn't hold a candle to Mario Kart 7, but you have to keep in mind that it came out over ten years ago. With that being said, this game has a whole lot to offer on its own merit: the graphics may be a little dated, and the multiplayer gameplay has been completely removed from this 3DS Ambassador version, but that doesn’t make the available gameplay any less fun. It may not have aged as well as some other classic games, Mario Kart: Super Circuit is still a good time and provides hours of kart racing action to anyone looking for it. I have really fond memories of this one but don't know if I want to go back to it quite yet after MK7 and F-Zero: Maximum Velocity. I feel like they have cumulatively scratched the Super Circuit itch. It was my first Mario Kart game. Playing it again today, I had just as much fun as I did way back when it came out. No multiplayer? That is inexcusable in a Mario Kart game. If they ever start releasing GBA games to the general public, this should be fixed. How hard can it be to emulate the link cables in wireless play. Glad I've got the old cartridge. It's one the system's best. I thought they were going to update the games so they had multiplayer? I thought Mario Kart super circuit was pretty good considering what they were working with. It obviously couldn't be as fancy as Mario kart 64 but it's still quite good. Very similar to the Snes original only you don't have the forced split screen. That was the only thing I didn't like about the first one. One of my favorite in the series. One of the games I miss having and need to rebuy this one soon. Still upsets me that it was stolen from me and the idiots at Gamestop wouldnt return it to me even though I proved it to them that it was mine to begin with. 7's pretty high for this game. Remember this game being garbage. Good review, score is accurate. It hasnt aged well. As a game at its time I'm sure it was great - but it offers the same as Mario Kart DS and Mario Kart 7, although the DS version was a big jump up. Without multiplayer I would go so far as to give it a 6/10. 7/10 with multiplayer - because even then it would still be vastly inferior to the other games. This was the only GBA Ambassador game that I did not enjoy. Maybe if I played it back when it first came out I could have come to appreciate it. I'll stick with Mario Kart 7 to get my modern fix and Super Mario Kart to get my retro fix. This is one of my favorite Mario Kart games, if not my favorite. The game may not be as accessible for multiplayer as other entries, but it more than makes up for it with a robust single player offering. Trying to get star rankings in every cup on every engine size is incredibly challenging, something I never managed to do on the original cartridge. And this game existed before the era of complete item chaos that Double Dash started, making the game more skill-based than future entries. This is and probably will be my favorite MK game. But i have to say, i need to get used to steering again XD It feels like the karts are constantly drifting. But i loved pretty much every aspect of the game. The colorful graphics, the music. It was also the first MK game i really put some effort in to get 1st place in every race, beat all the track records and so on. I like this game, but I think it has annoying and awful controls. Why was my post deleted that said there's no unlockable character? I'm only stating facts here? Wasn't trying to call you guys liars or anything. You're welcome to prove me wrong but I googled it and found no evidence otherwise. I loved this game. Loved it. I remember I got it and never really played it, but I was bored and picked it up again. I spent hours with this game, especially in anticipation for Mario Kart DS. The controls are well-suited for a 2D racing game, so no, the controls are not awful. They just aren't MK7 controls. According to my research and numerous online sources there is no unlockable character in MKSC. Now I see that they omitted the sentence in this review that said there was an unlockable character. Even back in the day, I always found this a bit...underwhelming. It does feel really strange to play this after my non-stop sessions on Mario Kart 7 the past few weeks, like a downgrade. Saying that, I think it had some pretty funky tracks. I can't believe Ribbon Road hasn't appeared in a Retro Cup yet. How do you unlock the SNES courses? I played this game when it first came out. Its ok, not my favorite Mario Kart game thats for sure. No multiplayer? Then NO POINT! Um... where did my comment go? I only gave a brief mention to the lack of a secret character, otherwise I was just stating my opinion on the game. It's a COVER-UP I tell ya! Revisionist history, Big Brother making sure we don't know the truth! Well I don't know what the real deal is with this supposed unlockable character. I'm getting conflicting info from both sides. Guess I'll have to go for all golds and see if I get anything. I don't remember if I did that before or not. I like it, too. I think it's flaws are part of its dated charm. You guys have to remember you probably weren't even born when this game came out! LOL..
@PhoenixCake LOL! Hey, how much are your tinfoil hats?? We decided to look into it further and ended up editing the review. The executive decision was made to delete some comments for the sake of posterity. After the edit, many of the comments would have made no sense. Please don't see deleted comments as an attack on anybody. We love you guys and we're glad that you know what you're talking about. Can you really unlock a character? It's okay no harm done. I'm just glad this confusion has been sorted out. I didn't mean to sound like a know it all. I Just wanted to make sure I wasn't going crazy. A lot of the negative comments I've been seeing about the game now concern the controls. I think a problem people are having is that Mario Kart has had essentially the same controls/physics since Mario Kart DS, meaning that they're really used to them. Just because this game controls radically differently does not make it bad. It just takes some getting used to (but it seems like people aren't willing to put in the necessary amount of time when they have Mario Kart 7 to go to). There have been rumors that this game had Waluigi as an unlockable character, but it's been proven false. This game's nothing compared to other entries in the series. It's free though, so I'm not complaining. 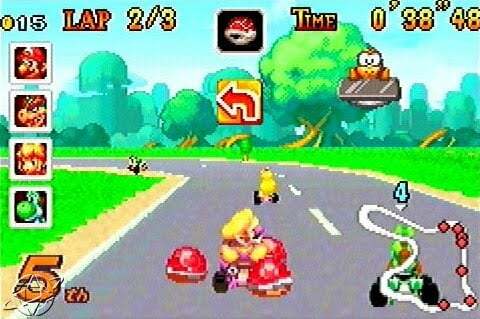 I use to play this all the time, but then I came back after playing Mario Kart DS for a good while and I just could go back to the handling in this game. Holding an item behind my kart with L while driving with the D-pad causes me great pain. Hopefully the Circle Pad works better. Well, grumblegrumble, I don't take any nation's currency to make these fancy hats. Can't support the governments that are trying to take control of our minds with invisible space ships and the like. However, if you were to pledge your undying loyalty to my organization we'd be happy to outfit you in full tin-foil gear. Stand up for peace, truth, and the American Way! I sold my copy long ago. The controls I thought, were horrid, just like I thought the same of the graphics, even back then. I did like the unlockables, however. Courses, I mean. SMK courses are the unlockables, complete w/ the music that went to each of the different SMK tracks. No unlockable characters as I recall. The ranking system was also pretty interesting. I haven't had much of a go but I don't get the steering in this game... do you need to brake for corners? Or can you power slide them all, or a combination of the two? Still trying to figure it out. This game gets a 9.5 out of 10 in my book. Ghost Valley 1 is the best track of any racing game ever. It never, ever, ever gets old. I wish I had a tally of how many times my brother and I have played that track. I'll bet it'd be in the hundreds of thousands. I love the string-bass-heavy music. Sounds great with headphones. The game is insane-o hard, though. On the original cartridge, I did unlock the orange title screen after much effort. Before i played this on the GBA SP i already experienced MK64. I loved the boost you get from drifts so much i really couldn't get into this one back then. And even if it may never happen i'm quite sure i won't play it again before it gets multiplayer options on the 3DS. It's a bit easier to swallow than their lacking in F-Zero though since there has been no portable version of it since the GBA days. I owned this game on the gba and I really loved it, I'd agree that it hasn't aged the best. The MK SS game on GB was my first game on the Advance. Great gaem. I wish they'd of released the Cheesland or one of the other GBA courses on the later retro cups, rather than Mario Circuit or Bowser's Castle X. I really like cheesland and the Luigi Circuit level which had rain and slick handling. That and the ice stages were way better than the Mario and Bowser circuit levels as opposed to the really unique ones. Skyland was great on DS though. 8/10 review. Contrary to popular belief, it still handles way better than SNES MarioKart. This used to be a good game 10 years ago. But when I start comparing it with the newer MK´s it´s no match for them. Controls are horrible, cars don´t turn the same way as they do in say MK7. Whether I try to just turn or slide (not even slide boosts in this one) I end up off course or in the nearby wall. I did clear all the cups in the original (and Retro ones in 50cc) but it was really hard. My friends didn´t have GBA´s or link-caples back then so I got to play multiplayer really rarely with my counsins (and since one of them didn´t have MK SS, we had to play those four tracks with Yoshi´s) and even then we´d rather play MK64. Good GBA game but one of the weakest Mario Karts in the series. I´ve played Mario Kart series since 1997 and my favourites are Wii and 7. @Besen - Ah, thank you for clearing that up, always good to know why. Just out of curiosity, will this be released to the public and will there be more GBA games? I am getting me a 3DS in February so I was just curious. Thanks! This is James McCloud. I once had it. Agree with revw. At the time of release on GBA it would probably just scrape a 9. However, now its completely bowled over by DS and 3DS versions. I think it still gets an 8 for me, but only just. Also you have to use the D-pad. What @66 said. This game is a real challenge. The controls aren't broken, they're just not what some latecomers are used to. ... Play the game and beat the game. Finally, a Mario Kart I can best my wife at. This is going to be a very special Christmas. Nice review, Ronny! I hated this game when I got it on GBA, and I hate it even more now. Ribbon Road rocks, but this game has aged terribly. I was very disappointed when this slid into the ambassador's list. Over the years I haven't played it much. I find it very hard on the eyes. One day I will try it again though! This game...is really just bad in my opinion. It has great graphics, but other than that I don't like it. It's just so sloppy around the edges. It is impossible to take turns, it is hard to see incoming obstacles such as a hole, and the characters are too unbalanced. If you want to play a good Mario Kart game, get ANY OTHER MARIO KART. 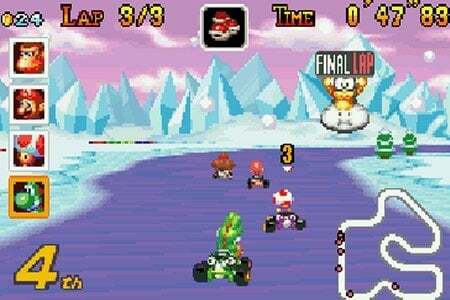 Mario Kart for the SNES gets a pass because it was on the SNES! This one is just (as stated before) really sloppy and poorly put together. I do love Mario Kart though. MK7, MKWii, MK64, and MKDS are all great Mario Kart titles. I haven't played MKDD, I just said I didn't like MK:SC, and I don't love SMK. I used to have this for my SP late in its life. But, I really didn't care for it at the time, so I sold it to GameStop (I think I was getting FlingSmash, if I remember correctly). A while later, I regretted the decision. So, I was thankful to find out that I'd be getting a "second chance" of sorts. Even though the game is nerfed from lack of multiplayer, it still isn't a bad title. Not the best Mario Kart, but not a bad title. One of the best mario kart titles out there. It has the SMK feeling. Even if the controls seems a bit slippery, when you master them, this game becomes lots of fun. Track design is really great despite being 2D. Shortcuts here and there are a nice addition to the tracks. Also, there is plenty of stuff to unlock in this game. Every CC class has a cup that needs to be unlocked. And as a bonus, this game even has the whole SMK tracks which is over 40 tracks in one game, and unlocking it its only half the fun. While this game has glitches, they aren't as unfair and frequently as in MK64. The only downside of the game is that is hard to set multiplayer since you need someone else with a GBA, but the single player makes it a great experience. @baba_944 Unfortunately, there are no plans to release any GBA games to the 3DS' eshop Virtual Console section for public purchase according to Nintendo.